Sometimes we’re compelled to offer the spare change from the car console, though our default response might be to look the other way. Homeless people are a part of our towns and cities, yet even the Christian community too often turns a blind eye. Everybody’s encountered a homeless person at some point in life, but few choose to respond. Fear isn’t always the cause; it’s often simple lack of know-how. How do God’s people effectively minister to those who don’t have a place to lay their heads at night? 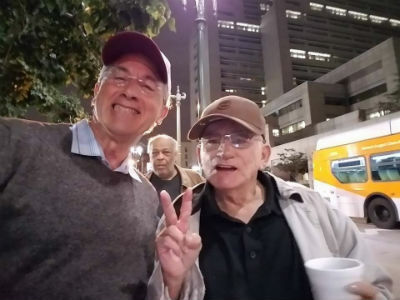 Pastor Eric Denton and Central Community Christian Fellowship, a Church of God congregation in Riverside, California, wholeheartedly embraces Jesus’ command to love “the least of these.” Perhaps that’s why they’re willing to hang out on the streets of downtown Los Angeles every Sunday night. Eric Denton’s pastorate at Central Community begin in February 1988. At the start of the Christmas season that year, he picked up the Los Angeles Times and his eyes were immediately drawn to the headline describing what Christmas was like for the homeless population. Eric had nearly finished preparing his first Advent sermon, but he couldn’t get over what he saw in the photo beneath the headline. Not one of the homeless in the picture was wearing a jacket. It was cold, so they’d resorted to building fires to keep warm—right on the streets of Los Angeles. Eric’s wife had also gotten him a classy leather jacket, and in view of what he saw happening in his own greater L.A. community, he heeded the prompting of the Spirit. Photo: Line for Jackets for Jesus. The trio inquired from a guy on the street for the location of the rescue mission. Upon finding it, they witnessed a crowd of five hundred people waiting to get inside. “We opened up my little Honda and said, ‘Hey, anyone need a jacket?’ The response was overwhelming, and we’ve been going back ever since.” But, since 1988, “Jackets for Jesus” has grown into much more than a coat giveaway. These days, a full-blown hot meal is served—every week. For fifteen years, the church had the same corner in downtown Los Angeles. Gentrification—“refining” part of a city with little appeal to middle- and upper-class residents—has forced the homeless population from their usual hangouts. Gentrification also forced Jackets for Jesus to move; city officials insisted the church move their ministry to a different part of downtown. Though frustrating for Eric and the church at first, the new location has proved to be an even better site for Jackets for Jesus. 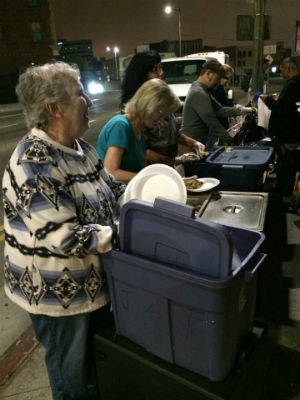 Volunteers serve a hot meal to the homeless. God called Central Community to minister to the homeless in downtown Los Angeles specifically because of the high concentration. 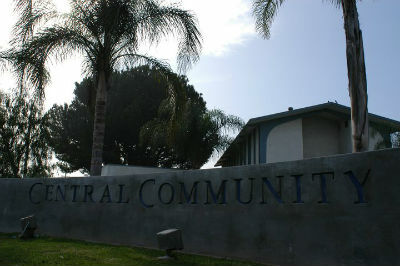 An estimated three hundred homeless live in Riverside. A jaw-dropping 58,000 live in Los Angeles—that’s roughly the population of the entire city of Anderson, Indiana! But don’t begin to think the church is ignoring Riverside. The service projects accomplished by this church of just 150–200 people is incredible, and as a result of their specialization, hundreds of volunteers from outside the church regularly assist. Central Community feeds almost 3,000 people on Thanksgiving Day, and delivers—yes, delivers—nearly that many meals on that same day! Volunteers have numbered over 600 on Thanksgiving, choosing servanthood over their favorite sofa and football. Furthermore, they’re making an incredible difference outside the country: the orphanage they founded in Tijuana, Mexico, is just one example, and another inspirational story. In the early 1990s, Sandi Patty recorded a song called, “The Gift Goes On.” The words remind us that “the Father gave the Son, the Son gave the Spirit, the Spirit gives us love so we can give the gift of love…the gift goes on.” Central Community—and the rest of the Church of God movement—have been given a gift. This gift is not meant to be hoarded, but passed on to everyone we possibly can. That’s the essence of Christmas. And that’s the heart of Central Community Church of God. 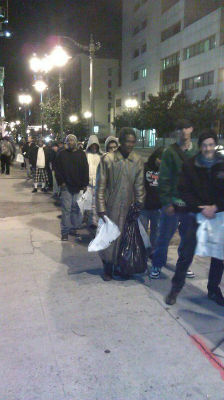 This entry was posted in All Church of God, Western and tagged CA, California, Central Community Christian Fellowship, Christmas, community, Eric Denton, gentrification, homeless, homelessness, Jackets for Jesus, meal delivery, outreach, poverty, Riverside, servanthood, soup kitchen, Southern California, Thanksgiving, urban, volunteerism, Volunteers. Bookmark the permalink.